Yesterday, we handed in the project description Virtually augmented physical learning spaces (VALS) to the prorektor at RUC. The aim of the VALS project is to transform the physical learning and teaching spaces at Roskilde University by applying a virtual layer to workshop, lecture and project rooms. This virtual layer will be based on knowledge and experience from the development of the Rich intelligent spaces (RIS) digital architecture and conceptual framework developed here in ExLab. 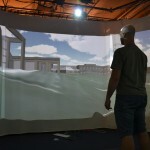 This entry was posted in Blog, Projects and tagged VALS, virtually augmented learning spaces on 2013-01-23 by sisse.